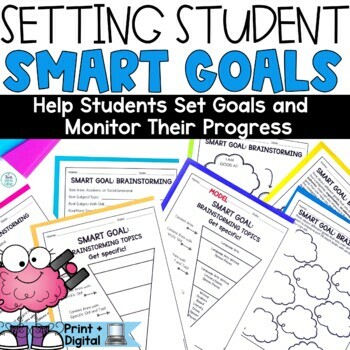 Make student SMART goal setting a part of your students' new year's resolution! 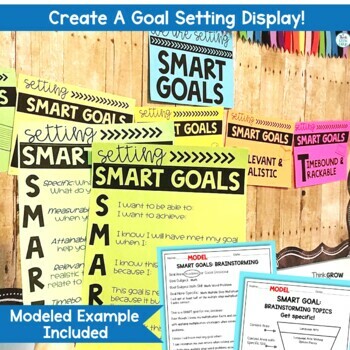 This goal setting and student tracking set will have your students expressing their hopes and goals for the upcoming year. Students will be creating their own learning goals. This pack has everything you need to have your students reflect on themselves as learners and set appropriate goals. Have your students revisit these goals periodically to see if their goals have been met through self-progress monitoring. Student brainstorming activities, goal setting, and self-monitoring checklists are included. Please see the preview for a more detailed look at this product. "Loved using this product with my kiddos. Made the very difficult process of creating goals much easier for them in a fun, engaging way. THANKS!" "Great resource to get the student invested in their own learning. Thanks." 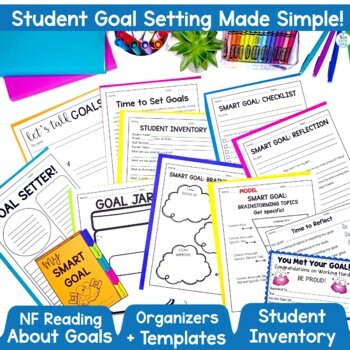 "Awesome resource to help students develop goals!" "This is just perfect! and super easy-- just print and use! Thank you!"